﻿ lebua at State Tower, Bangkok | FROM $107 - SAVE ON AGODA! Have a question for lebua at State Tower? "What stands out here are the staff - courteous and helpful - the hotel has a genuine desire that you enjoy your stay - highly recommended"
"The staff took care of our luggage and brought a very nice welcome gift upon check-in." 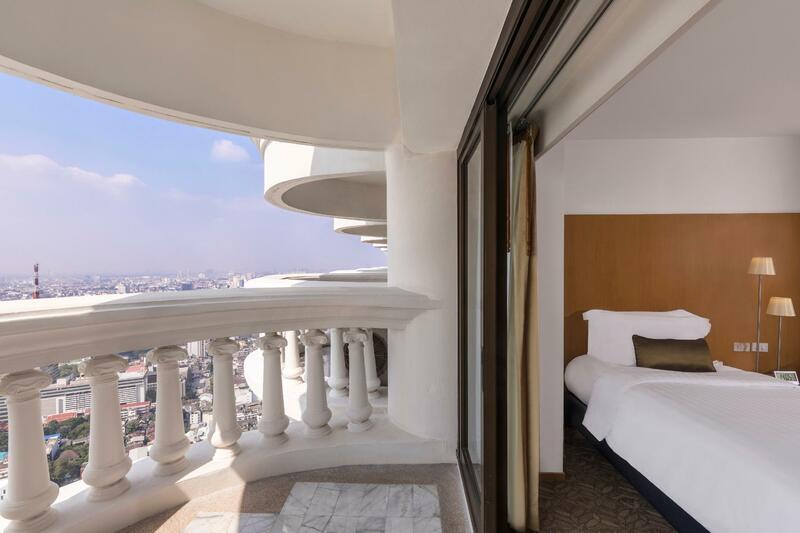 "Been back many times the staff out so amazing - happy and we..."
Fall in love with the luxury of the Lebua at State Tower and enjoy all that Bangkok has to offer. The property has numerous convenient features, such as a salon, an infirmary, a selection of shops, a currency exchange, as well as a smoking area. It features a fitness center, a sauna, an outdoor swimming pool, a hot tub, and a spa among other great facilities. The Lebua at State Tower offers river and city views from its rooms, so you are bound to be peering out at memorable scenery. It is near State Tower, Naraya Patpong, Sirocco Sky Bar, Thai Native Gems, and Assumptionsuksa School. The property has air conditioning, a hair dryer, a shower, and an in-room safe box, as well as slippers, bathrobes, ironing facilities, a sofa, and more. If you want to spend the day relaxing and unwinding, get a massage nearby. With guided tours available, the Lebua at State Tower is a great spot to stay to learn about the area and see everything you can while you're here. From dry cleaning services to daily housekeeping, the property provides various convenient services that guests can take advantage of throughout their stay. It has a variety of transport options which include airport transfers, shuttle services, and car rentals. From a bar to restaurants on the property, the Lebua at State Tower has a range of dining and snacking choices. With Thai, American, and Asian restaurants nearby, you can experience all the delicious flavors of international cuisines. Have a delightful meal at Orchado, Saffron, Jam, Enjoy Bkk Bistro & Bar 57/1, Bridge Cafe and Art Space or other eateries nearby. There's free Wi-Fi in all rooms, as well as Wi-Fi in common areas, so you don't have to worry about buying a local sim card during your visit. The Lebua at State Tower offers express, private, and 24-hour check in and check out, so you can use the option that best suits you. Featuring a front desk that's open at all hours, this property ensures that there is always a staff member on call to help you with any queries. With pet-friendly facilities, it is perfect for visitors who wish to bring their pet on holiday with them. The Lebua at State Tower offers check-in from 02:00 PM and check-out until 12:00 PM. It is equipped with a kids club, keeping your children entertained while you enjoy your time away. The Lebua at State Tower offers family rooms, so your family will have adequate space to sit together. "We will definitely come back again"
Please note that the Suite’s balcony will be unlocked upon personal request. The balcony usage form must be signed upon check-in, and guests using the Suite's balcony must be at least 14 years old. At The Tower Club Lounge, the following dresses are not permitted: athletic or sports uniforms, torn clothing, slippers, beach sandals and flip-flops. Gentlemen must avoid any sleeveless clothing, shorts, and open shoes. Please note that the hotel’s smart casual dress code applies to children. A credit or debit card security deposit is required upon check-in for charges or damages during the stay and will be refunded upon departure. The property accepts major credit cards, including VISA, MASTER, JCB, AMEX, and China Union Pay. However, Diners Card is not accepted. Please note that the hotel offers a scheduled shuttle service to the BTS Saphan Taksin Station between 07:00 am - 05:00 pm daily. The hotel is super organized with an excellent staff, very helpful and professional. Rooms are spacious with view over the city or river. Don't forget to take a drink on top at the unforgettable Sky Bar. Last but not least: the incredible breakfast! It was our 2nd stay but not the last one. Great room-we were upgraded to a fantastic river view room! The staff and room were top notch from check in to check out and beyond! Our room was perfect! We stayed in the 2 bedroom jr. suite and it was everything we wished for- we wanted to stay longer! The staff took care of our luggage and brought a very nice welcome gift upon check-in. Thank you for a memorable and pleasant stay! I travel often and stay in many accommodations all over the world and the Lebua has earned my highest rating. Elegant and spacious rooms with all the amenities of home with friendly and hospitable staff who are attentive to your every need. Amazing view of city and river! Sky bar was very nice, although I didn’t want to be escorted to the smaller bar first to work my way up to the larger one I envisioned from cinemas. Mezzaluna did not disappoint! Chef Ryuki Kawasaki prepared the most spectacular meal. His staff was extremely attentive and friendly. This was an event of a lifetime and I am truly grateful to the Chef, General Manager and all the staff for the highlight of my visit to Bangkok. Beautiful facilities, outstanding breakfast.. awesome staff. Worth every penny. Only caution are the rooftop restaurants and bars- food average- prices out of this world... way overpriced. Can find better places in Bangkok and great views as well. We had a real great stay at Lebua and it was probably one of our best experiences ever! I knew it's a famous place for Hangover movie and I read about its dresscode & other things so we were prepared) Some write reviews that the staff are a bit snobbish and rude as they know the hotel is famous anyway but I would totally disagree: Everyone from Reception to HK and Skybar staff were very hospitable extremely polite and courteous. They r really professional & made amazing pics. The suite room is a separate story: Just Amazing view and facilities, the best ever! Coffee machine, complimentary mini-bar, sitting area, balcony, HK service in the evening - All Great! From the moment you walk in you feel you are in a classy hotel with a good name which is totally deserved. Breakfast is just amazing choice and taste. We simply Loved the Lebua at State Tower! Iebua was nice. The room was huge, gorgeous and clean. It's a little weird that the hotel is located in a mall. It was very nice but we preferred The Peninsula which is 5 stars in my opinion. The rooftop bar is stunning but drinks are way overpriced just to see a smoggy skyline. What can I say anyone who stays here will be enthralled, its stately, has amazing restaurants at the top, and the sky bar is awesome. Not cheap, so bring your AMX, or sugar momma. The rooms can not be denied clean, plenty of space, views, and the beds is perfect for sleeping or ??? you know. Welcome to Amazing Thailand. We stayed here during new years eve. It was worth every dollar we spent. Great river view and good to der fire works. Breakfast was awesome as well. It was good to stay in one of the biggest hotel and resorts in the tourist area. Near ferry port and subway. Both of Rooftop bars in 52th and 64th floors are definitely ‘a must’ for toursts. You can stay and meet your friends here since all of them want to visit! In fact, food was much better than expected. Any bad thing? Local staff members lie about many things like taxi or limousine services. French and German clerks were better being served from since they were honest and sincere. Perhaps my bias, or NOT!! Beautiful hotel . However it doesn’t have a warm feel . No character. Rooftop bar is ridiculously over priced and they don’t serve beer . Had to go to a local tailor to buy trousers as wasn’t allowed in the lounge with shorts . My friend's room was opened by all cards. Even by not their room cards. The interesting fact is that we stayed in suite room on 57st. You should check that your lock is working well before u get in. It was really shocking. Best hotel i ever stayed in, and i travel alot globally. Great service from entering the hotel, amazing restaurants , and without doubt the best hotel breakfast i ever had , including a large variety of different types of food in ordet to fit a global audience . Rooms are also very good, most of them has balconees and bed is just wonderful. Best hotel for the money !!! No need to leave this hotel. All the facilities you could want are here. The sky bar is magnificent. Breakfast selection is unbelievable. Should you need to leave it’s a short walk to the BTS and to the pier to catch a river boat. The hotel was very posh with very attentive and helpful staff. Situated at a very beautiful location overseeing the river. Traffic nearby can be pretty congested and travelling to the Siam shopping belt by vehicle can mean jams. Would have been a perfect score if not for the inconsistent water temperature in the shower in the room. From the moment you arrive you are greeted with excellent staff, service and attention to detail. The hotel offers a lot of dining options, all with amazing views that comes with a price. I guess when converting pounds, dollars or euros makes it far more effortable. The views from the Sky bar are spectacular and an amazing experience. The breakfast is to die for, both from a quality and variety point of view. There are a few restaurants in the area within walking distance from the hotel. We enjoyed our stay and will definitely recommend Lebua when visiting Bangkok.